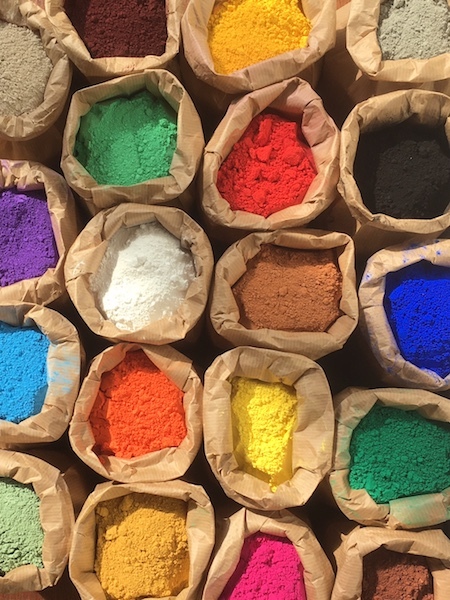 Pigments (colouring matter) are used to colour paint, ink, textiles, plastics and other materials. Pigment is a powder of small, insoluble, highly tinted granules. To work with pigment you need a binder. Pigments are insoluble in water, while dyes often are soluble. Dyes are commonly vegetable or animal colouring materials. A pigment’s name can sometimes be traced back to a (chemical) process. Death’s Head red / purple is named for the reaction vessel in which it was once prepared. Many imaginative names have been made up over the years. These often indicate a certain shade, geographical region, or piece of equipment. The colour can often not be ordered under that name. Examples: canary yellow, blood red, aquamarine blue, Zaans green. Pigments and chalk are ground in the mill whenever the wind permits. A range of pigments are ground in “The Red Room”. Since this chamber has to be cleaned from top to bottom for each different colour, large quantities of a single colour are usually ground at one time, such as yellow and red ochre, and tile red (from ground roof tiles). The big edge runner stones are used to grind champagne chalk from France. Forbo, the linoleum factory, buys this product from us for use in their manufacturing process. The product is also used to mark the white lines on football fields. The chopping station is used to reduce tropical hardwoods, such as pernambuco , Campeche or bluewood, to splinters. They are then ground further in the “Red Room”.